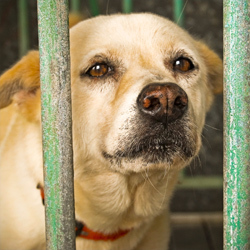 Gas chamber euthanasia is a barbaric practice that's still legal in most states. Take action now! Many animal shelters in America are still using the archaic and cruel gas chamber euthanization method. This practice involves putting animals into a small room and unleashing deadly carbon monoxide gas, which eventually suffocates them. There have been reports of animals becoming extremely unsettled and crying during this process. The most widely-accepted method of euthanasia in the United States is the injection of sodium pentobarbital — a substance that can quickly and painlessly end an animal's life. With this information in mind, there is simply no reason the gas chamber practice should be allowed to continue. Gas chamber euthanasia remains legal in at least 30 states. Sign the petition urging Secretary of Agriculture Tom Vilsack to outlaw this inhumane and barbarous practice in all 50 states. I am appalled to learn that gas chamber euthanasia is still a viable method of putting animals to sleep in some states. Gas chambers have been largely ruled out as inhumane for humans who are to be put to death, yet it remains permissible for animals. I don't see how this makes any sense. In fact, there have been reports from animal shelters who claim that, upon release of the deadly gases, animals become extremely unnerved, fight with each other, gasp for breath, and cry out in pain. At least twenty states now outlaw this barbaric euthanasia method, but that means it's still legal within the majority of the United States. With the existence of cheaper and more effective alternatives, lethal injection in particular, it's a wonder why this process is still allowed at all. Please lend your influence and expertise to see that gas chamber euthanasia is done away with once and for all.